This upright arcade game has over 150 all time favourite arcade games packed into it. The ultimate in retro cool for everyone in the family, old and young alike, providing endless hours of exciting action and fun. Fitted with genuine arcade buttons and joystick controls for reliability and authenticity. Featuring a 14" high resolution colour monitor, protected by a high impact clear perspex screen. Mains on/off and volume controls are fitted to the rear. There's no assembly required, you just plug it in and play. The digital sounds, spectacular colour and dynamic graphics provide a superior playing experience. Scroll down the on-screen menu with joystick for quick and easy selection of games and instantly exit and reselect new games in a flash. This arcade game even has a pause button allows to prevent interruptions stopping you finishing a game off. Play one another with the easy control panel 1 or 2 players option. This Arcade Game is the perfect addition for the home, games room or workplace. 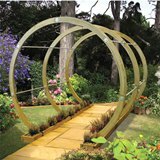 An eye catching structure which allows you to grow flowers over a walk way or path. Made from Pressure Treated timber.